I have to begin by explaining that we don’t have central air conditioning. One searing August after we first moved in and it seemed you could see the heat shimmer off our kitchen floor, we decided to get an estimate. When it arrived we fought off the nausea, politely said, “We’ll have to think about it” and bought three window units, instead. When my father-in-law’s aunt passed away several years back we inherited a fourth, an ancient monstrosity that sounds like a truck struggling up a steep incline and may have been built in Thomas Edison’s lab. I’m not sure who wired the electricity in our house but I don’t believe he had all of his vision or the use of both arms because it is a tad, how shall I say, unbalanced. I blew out an outlet in the upstairs bathroom once and found that the outside lights, the garbage disposal and a closet in the attic are on the same Rubik’s cube of a circuit. The upshot is that the electrical “system” won’t support a window unit in Clay’s bedroom, which means it is too hot to sleep in during much of the summer. (Not that that seems to have bothered him in the past as he burrowed completely under his covers year round dressed in full-length pajama tops and bottoms, even wearing socks.) This year, now that he is more of an underwear and a t shirt guy, we’ve been letting him sleep in the living room, where we can leave the AC on during the night. There are two identical sofas in our living room, set up perpendicular to each other. Here’s the fun part. Both Clay and the dog prefer the same sofa. 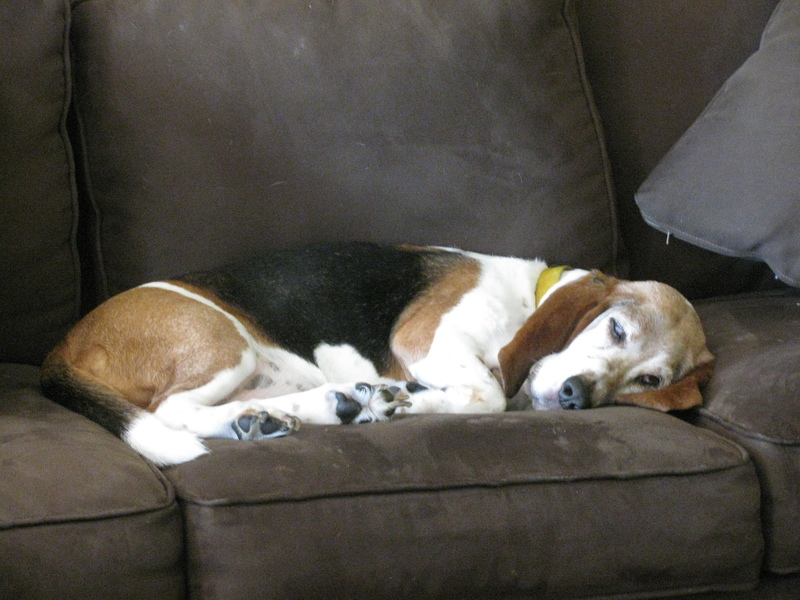 Miles, the basset hound we rescued last fall, likes to sleep on the sofa facing the fireplace. As best we can tell, he never slept in a house in the seven years before he joined our family. That sofa is a precious refuge for him. I work at home, so I can testify under oath that nothing short of flames shooting from the cushions around him will remove Miles from that sofa from about 7:30 in the morning until noon, when the promise of some scraps from my lunch lure him into the kitchen. At night, he is back on his sofa, lost to the world. As luck would have it, Clay, for some reason, favors the same sofa or, more often, the floor in between the coffee table and the sofa (which amounts to the same thing since the dog’s comically short legs preclude jumping over him). So the battle lines are drawn. Sharing the sofa appears out of the question. As does moving to the other sofa. Did I mention they are identical? Sometimes Clay will leave his comforter on the sofa, which is a mind-blowing nirvana for old stumpy legs. The rare time I’ve heard a growl from this timid dog—he visibly flinches when we pick up the newspaper to put in the recycling bin—was when Clay went to pull the comforter out from under him. Clay, through a sheer size advantage, clearly has the upper hand in this war of positioning, leaving Miles lost. Sometimes he sleeps on his dog bed in the master bedroom, but he is restless without his sofa, so we have had to banish him from our bedroom. Sometimes he sleeps on Clay’s bed (a fitting swap) despite the heat. Sometimes Clay gets up in the middle of the night for awhile and settles back on the other sofa. Miles pounces on the opening. For a raggedy sleeper like me who often wanders the house at night, there is no telling who will be where if I come through the living room. All that is for sure is that Clay has first dibs. The other night, I spotted Miles on the stairway landing looking longingly at his sofa, knowing it was not to be. Clay had already staked his claim. Hang on little fellow. Fall will be here in a few weeks and your comfy spot will be restored as our summer chaos shifts to winter chaos. It’s a dog’s life for you. This entry was posted on August 12, 2011, 9:19 am and is filed under Communicating, Daily Life, Silly Behaviors. You can follow any responses to this entry through RSS 2.0. You can leave a response, or trackback from your own site. Poor Miles… I love that the sofas are identical, and of course it still matters! Happy for all of you that Clay is sleeping no matter what!